The HP Helion Network offers these unique commercial models and operating modes. Ecosystems as a business network: HP meets the demands of customers through an ecosystem of exceptional partners. Collaborative opportunities: The Helion Network is a collaboration of innovative services providers, software providers and value added resellers (VARs) designed to provide cloud consume options for enterprise as well as small and medium business (SMB) markets. 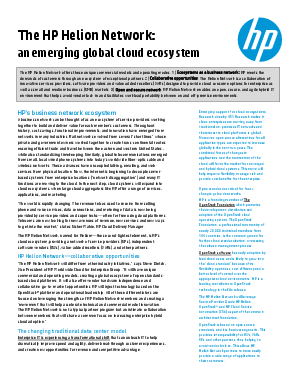 Open and secure network: HP Helion Network enables an open, secure, and agile hybrid IT environment that helps avoid vendor lock-in and facilitates workload portability between on and off-premise environments.